Growing up, we learn from our parents the traditions of welcoming friends and family into our homes. 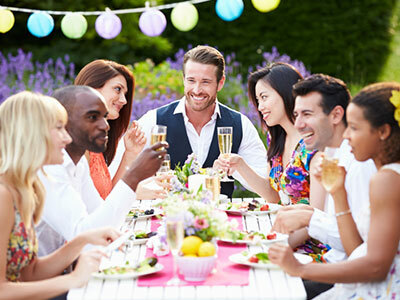 As adults, we come to truly understand the larger value of hospitality: The sense of connection and community it fosters. Mark Nepo, author of MORE TOGETHER THAN ALONE, shares insights into how hospitality reminds us that we belong to each other. No human life, not even the life of a hermit in nature’s wilderness, is possible without a world which directly or indirectly testifies to the presence of other human beings. This is why every tribe, tradition, and spiritual path has rituals and symbols: to help us remember who we are and the web of relationship we are a part of. A great example of a symbol ritualized to help us remember our larger home is the use of sacred wampum in the Native American tradition. Originating with the Algonquin tribe of the Northeast, the average wampum belt was about six feet long, containing more than six thousand beads made from white or purple shells gathered from the sea. Wampum was considered an aid in preserving the oral tradition of the tribe. Each bead contained a tribal memory. The more beads, the more sacred the wampum belt. In essence, it was a story belt which preserved the collective memory of the tribe. The string of sacred wampum was often held by a speaker to verify that he was speaking the truth. This tradition of speaking the truth involves certain rules of engagement when listening to each other. To begin with, each must accept the other as they are, putting aside assumptions and expectations; each must accept the other as equal; and each must be honest, clear, and forthright. What a sound way to face each other. When the Europeans arrived, they mistook wampum as simple currency and never inquired into its sacred nature. And without knowledge of our stories, the sanctity is lost and the sacred is reduced to mere currency. This happens every time I objectify you without taking the time to inquire into the personal history and meaning of what passes through our hands. We might do well in our own lives to form a bead or gather a shell for every important passage we live through. Creating our own wampum belt will give us the strength to accept each other as we are, and to speak truth to each other. Want more wisdom from Mark Nepo? 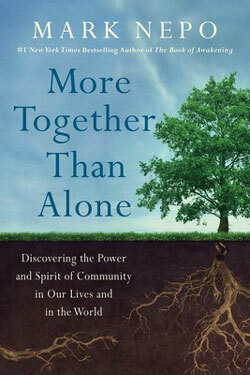 Watch the video below on the power of community and grab a copy of his book MORE TOGETHER THAN ALONE. The power of community can seen throughout history. Read how Lorenzo de’ Medici created a new world out of loss.